Why do You Need the Navagation Screen Protector? Prevent the Fingerprint Smudge the Screen. Protect your screen from Scratch,Explosion and Debris. Defend your screen from oil or other dirty things,Reduce your eye's fatigue. When you drive with your lovely girl/boy,you can see her/his face from it. What makes the protector film so special? 1.Ultra-thin thickness will not affect the sense of Touch,smooth and better touch feeling. 2.9H Hardness can ensure scratch resistant,effectively resist the collision of hard objects and friction, more anti-scratch performance. 3.HD Transparent maximum restore the color, to bring a clear and true navigation user experience,high definition and great durability. 4.Easy to install,Automatic Adsorption can effectively reduce the fingerprint and oil, hydrophobic as well as bubble free. Which Cars fit for the screen? Before you make the order,make sure that your screen is the original type. When you install the protector,pls put the suction on the CORNER of it. We also accept customized,pls tell us your demand. If you met some problem during use it,pls tell us,we will reply you at the first time. 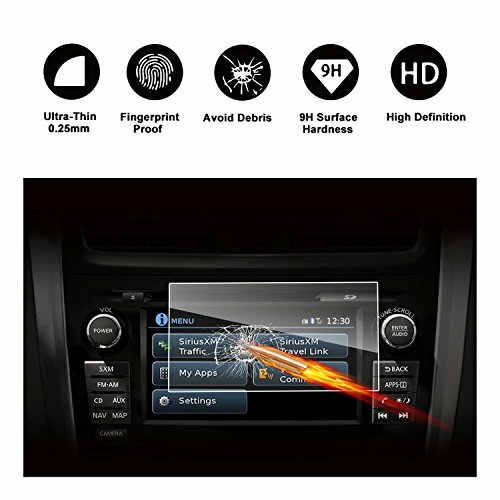 SUPERIOR PROTECTION,9H Hardness and 0.25mm Thickness,this glass cover maintains the touch capabilities of your GPS navigator while ensuring better smooth touching feeling,Anti-Scratch & Anti-explosion. CRISP AND CLEAR VISUALS. Installing the screen cover will not affect the color, icon size and touch screen capabilities of your GPS display. It will only keep it safe from dust, scratches, oil, water and fingerprints etc. NO MORE FINGERPRINT SMUDGES. Layered with an oleophobic coating that repels oil left from your fingerprints and adds an additional smoothness to the navigating screen. LASER CUT FOR PRECISE FIT. No need to trim the edges, as it is compatible with 2015-2018 Nissan Rogue 7''. ENJOY HASSLE-FREE CLEANING. To keep your GPS screen protector clear and dust-free, simply wipe it with a microfiber cloth. No need to use harmful cleaning substances. View More In Screen Protector Foils. If you have any questions about this product by RUIYA, contact us by completing and submitting the form below. If you are looking for a specif part number, please include it with your message.